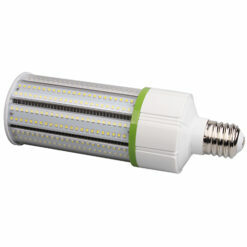 LED COB Lights (Chip On Board). Versatile interior and exterior lighting. Chip on Board (COB) LED lights install in a variety of exterior and interior fixtures. Exterior use includes street lights, parking lot lights, parking garage lights and stairwell lights. Interior installation includes both low and high bay ceilings and track lighting. COB manufactured with standard Mogul base (E39). Adaptor available for E26 medium base installation. CCT 5000K. DLC rated. IP64 rated against dust and water intrusion.